Pat the chicken dry with a paper towel; season generously with salt and pepper and the tagine spice blend. In a large sauce pot over medium heat, warm 1 to 2 tablespoons oil until hot but not smoking. Working in batches if needed, add the chicken and cook, turning frequently, until browned but not yet cooked through, 2 to 4 minutes. Transfer to a plate. Add more oil between batches if needed. Do not clean the pot. Peel and thinly slice enough onion to measure 1 cup [2 cups]. Separate the pulp from the preserved lemon peel. Coarsely chop the pulp and thinly slice the peel, keeping them separate. Coarsely chop the cilantro; divide into two equal portions, one for the tagine and one for garnish. In the same pot used for the chicken, warm 1 to 2 teaspoons oil over medium-high heat until hot but not smoking. Add the onion and preserved lemon pulp, season with salt and pepper, and cook, stirring occasionally, until the onion starts to soften, 2 to 3 minutes. Stir in the tomato paste and cook until starting to caramelize, 1 to 2 minutes. Add the chicken and any accumulated juices, tomatoes, half the cilantro, and 1½ cups [2¼ cups] water and bring to a boil. Reduce to a simmer, cover, and cook until the chicken is cooked through and the sauce has thickened, 10 to 12 minutes. To the pot with the chicken, stir in the artichokes and spinach, in batches if needed, and simmer until the artichokes are warmed through and the spinach is just wilted, 1 to 2 minutes. Remove from the heat, stir in the preserved lemon peel, and season to taste with salt and pepper. Set the tagine on the table, garnish with the remaining cilantro, and invite everyone to serve themselves. Divide the cilantro into two portions. Measure the water for the tagine. 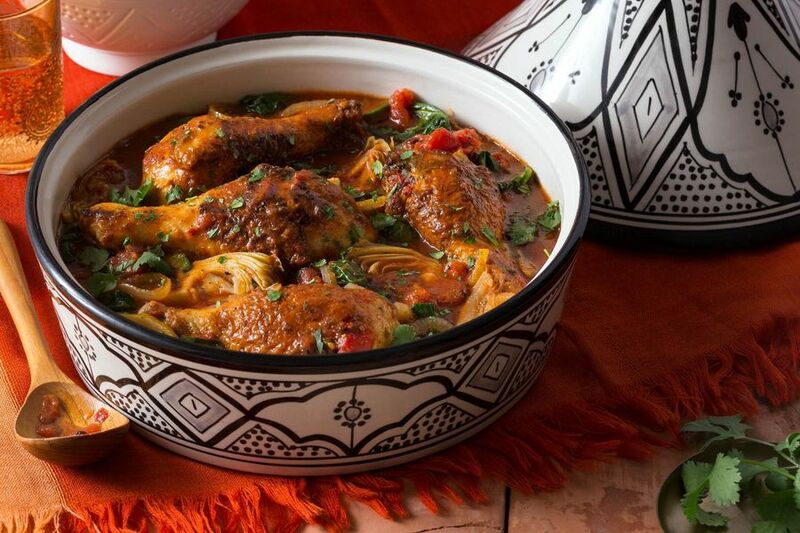 Our signature blend of spices, which includes coriander and sweet paprika, creates layers of flavor in this one-pot chicken dish. An Arabic word meaning “shallow frying pan,” a tagine is a clay pot with a wide, shallow base and a cone-shaped lid. Together they form a portable clay oven traditionally used to cook food over coals. The lid allows steam to rise, condense, and then drip back down to continually baste the stew. Calories: 480, Protein: 36g (72% DV), Fiber: 8g (32% DV), Total Fat: 26g (40% DV), Monounsaturated Fat: 13g, Polyunsaturated Fat: 4.5g, Saturated Fat: 6g (30% DV), Cholesterol: 155mg (52% DV), Sodium: 470mg (20% DV), Carbohydrates: 25g (8% DV), Total Sugars: 7g, Added Sugars: 0g (0% DV).